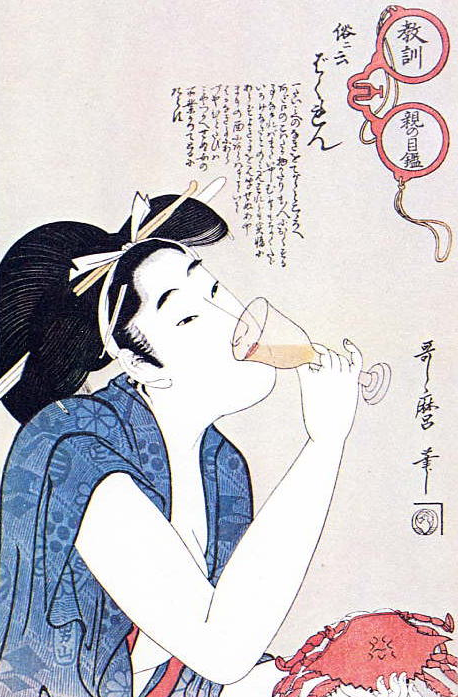 Japanese healthy food & slow life | tofu, sushi, Japanese green tea, home cooking, and confectionery… would you like to peep into Japanese healty slow food life & seasonal events? I felt the sign of Autumn recently but it has been hot and humid again like summer since yeaterday. It is hard to adapt to the sudden change in weather and temperature. That makes us vulnerable. We should eat well to beat the summer heat again at very such time. 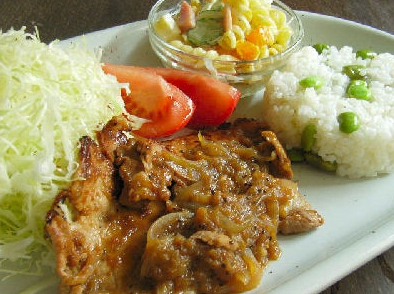 This recipe is the delicious Japanese home cooking dish. Do you eat pork meat? If you are interested in it, please try it! 1, Arrange porl loins on rectangle tray, add A and marine, and leave them for 15min. 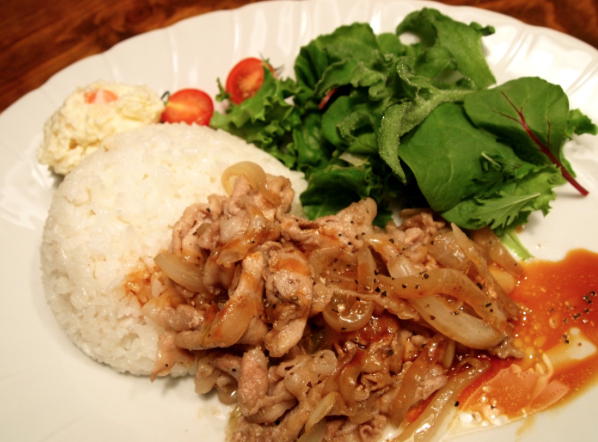 The time length depends on the thickness of the pork. 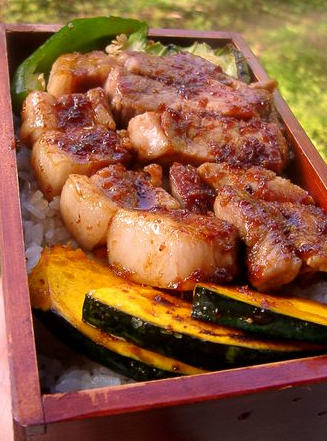 2, Heat the cooking oil in a frying pan, and lay the marinade pork and cook. Pour the rest of A over the pan. Turning the meat and heat through and turn in the sauce so they are coated. 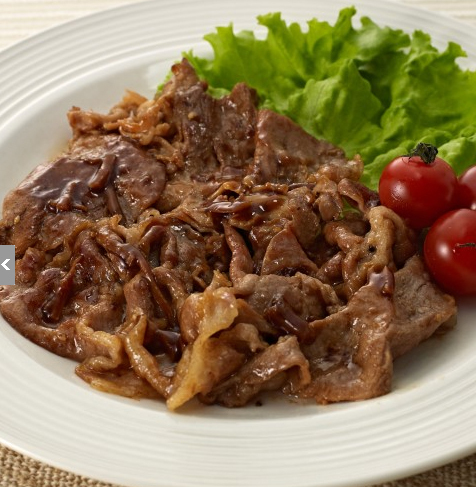 3, Arrange pork and vegetables…for example , thinly sliced cabbage into bowls, cut cabbage thinly as it goes well with the pork. That’s all! Easy, isn’t it? 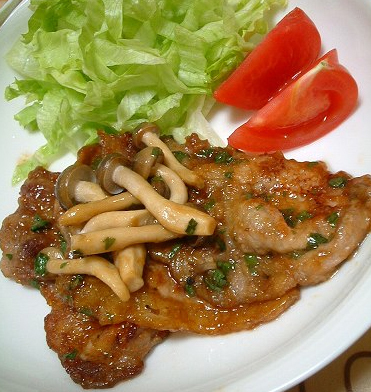 You can use this recipe in other pork meat! 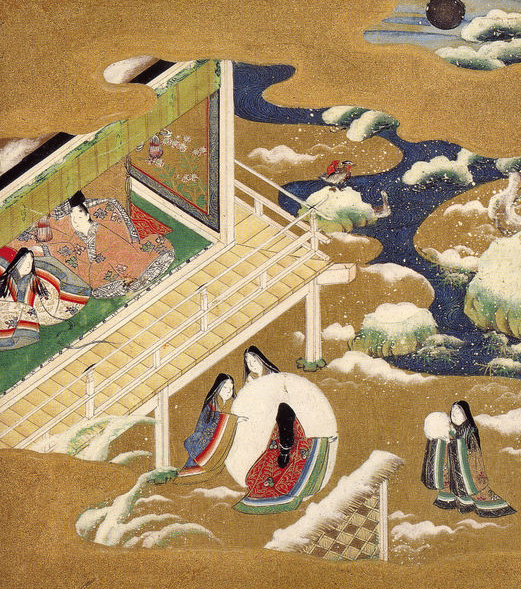 “Tsukimi” in Japanese is the custom event of viewing the moon in Japan. 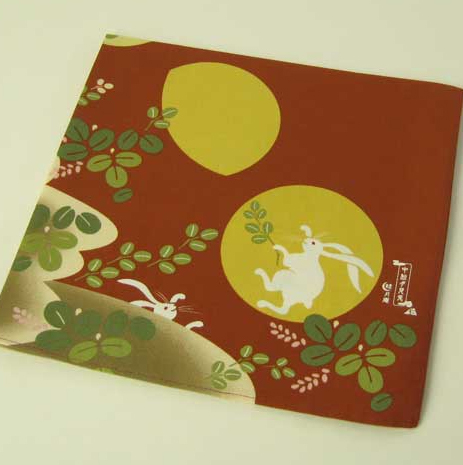 Especially, “Tshukimi” at the Harvest Moon in mid-autumn night is a traditional seasonal event. 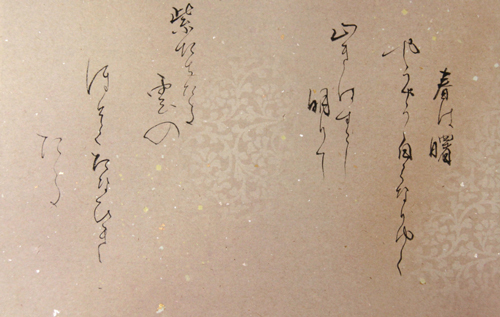 This is held on August 15 according to the lunar calendar, which is on September 19th this year 2013. 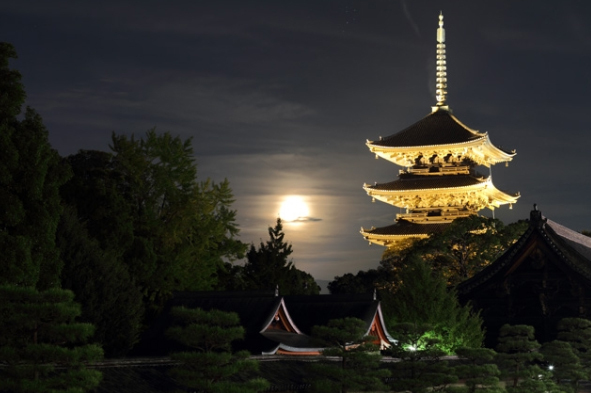 Many Japanese appreciate the full moon, and traditionally, offer rice dumplings and Japanese pampas grass, seasonal fruits and vegetables to the moon. 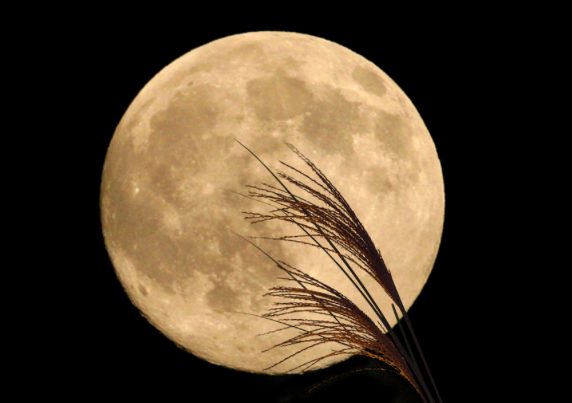 The harvest moon is the moon at and about the period of fullness that is nearest to the autumnal equinox, and one of the most beautiful of the year with its perfectly round shape. Thus there is no long period of darkness between sunset and moonrise around the time following these full moons. In times past this feature of these autumn moons was said to help farmers working to bring in their crops. They could continue being productive by moonlight even after the sun had set. Hence the name is “Harvest Moon”. 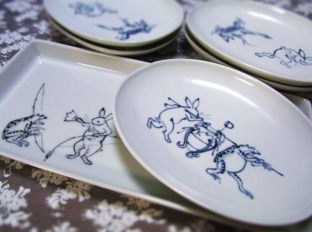 Anyway, we can see the rabbit motif in many traditional Japanese objects and scenes still now…Kimonos, Japanese dinnerware, Japanese tea things…if you have a chance to see them, please remember that motif is Japanese traditional style! 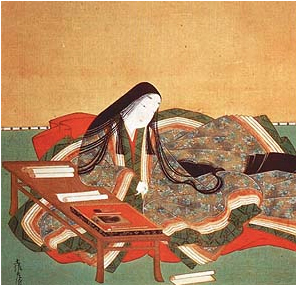 Long, long ago there lived an old man and his wife in a village. Being honest and hard workers, they were always so poor and lived from hand to mouth. 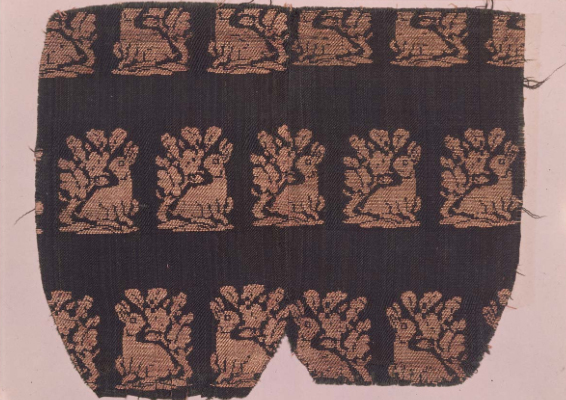 One day he went to a mountain as usual to get woods, when he found a rabbit caught in a trap. He freed her from it. 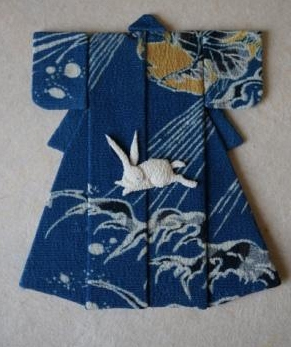 A few days later, a lady in white Kimono visited their house. “I see. You can stay here in this house if you want to. 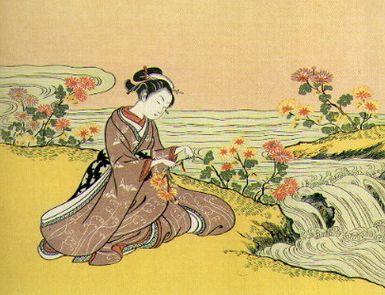 But as you see, we are so poor that we don’t have much rice.” said the old man. As the old couple had no child, they took care of her as if she were their own daughter. 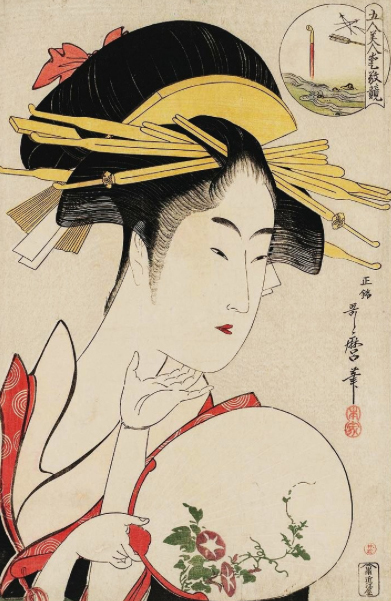 She worked and worked, helping her father with the rice-field and getting woods, helping her mother with cooking, washing, sewing and so on. Having worked day after day, their life never changed for the better. 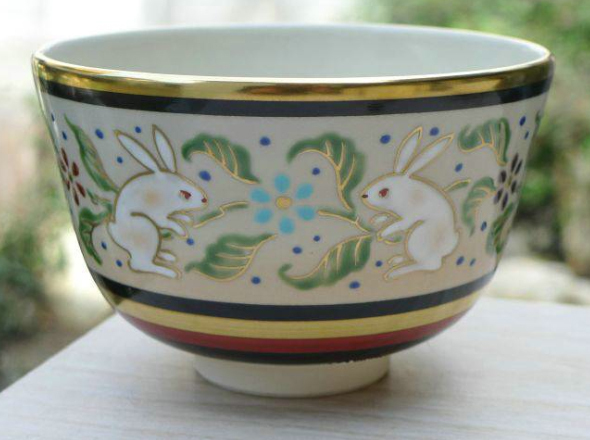 On saying so, she changed into a white rabbit and jumped into a big pot, in which stew was being cooked, on the hearth. They tried to help her but it was too late. 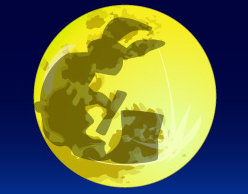 The steam out of the stew went up and up to the moon. 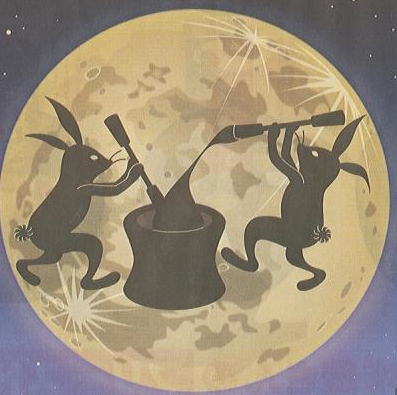 To their surprise, they saw the rabbit smiling and making rice cake in the full moon. They never felt hungry. 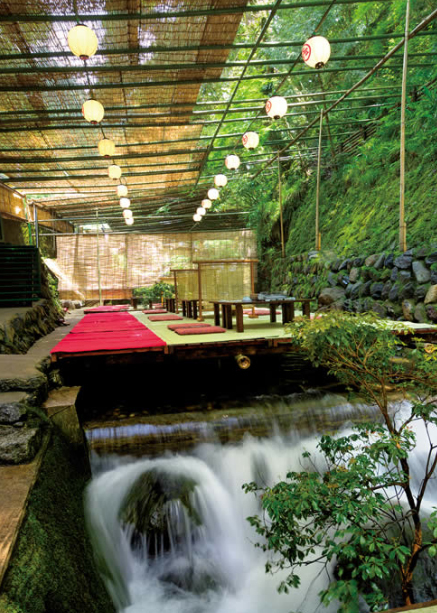 Have you heard the riverside terrace during summer in Kyoto? 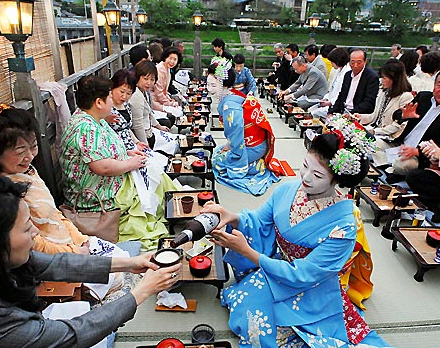 Even for many japanese people who do not live in Kyoto, this riverside terrace is a fascinating place and event. 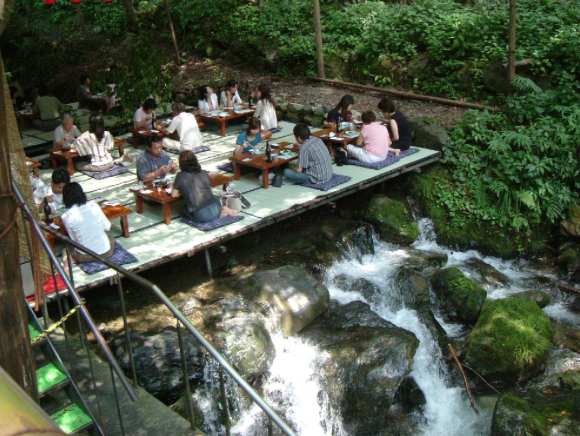 The riverside terrace put is place from May 1st to September 30th, so, it will soon be held in the end of this month. 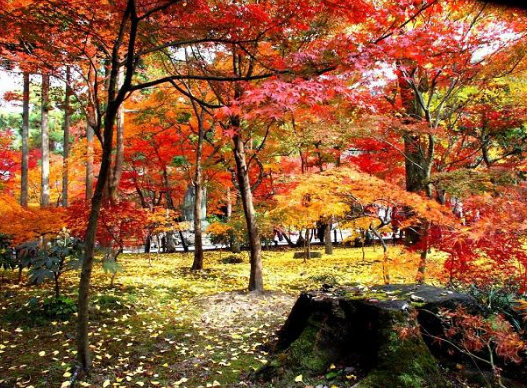 It has still been a little humid in japan, but I feel several signs of autumn recently, so this event season reached its final phase…If you have a chance, please visit and enjoy it! 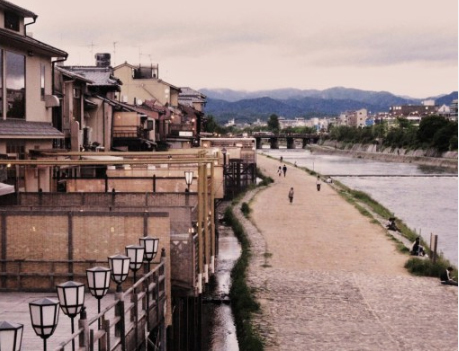 “Noryo-yuka” are the platforms that restaurants along the Kamogawa (the Kamo River) put up in the summer, extending themselves out to the river’s edge. 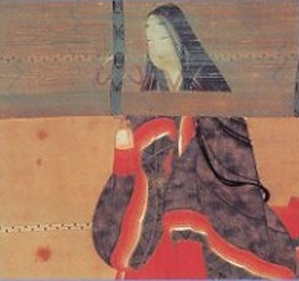 Noryou means, “Enjoying the cool evening” (amazing that Japanese has a word for that) and Yuka means “Platform” or “Flooring,” or more specifically in this case, a temporary wooden terrace, a deck. 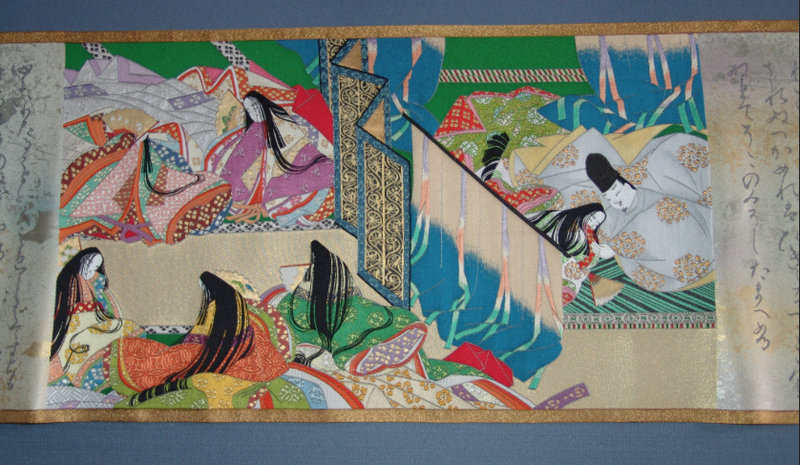 People in Kyoto call them “Noryo-yuka” or simply “yuka”. 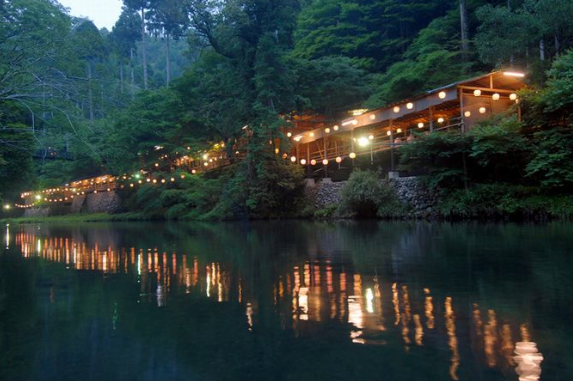 The Kamogawa separates city Kyoto from the sublime, quiet Higashiyama (East Mountains) area. 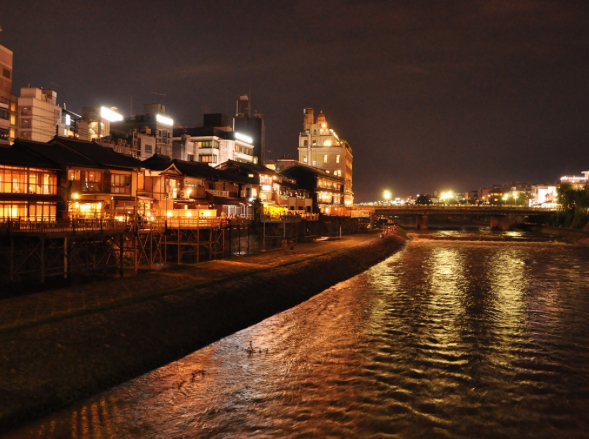 Their wooden floors, connected with restaurants, are built over the Kamo River from Nijo-dori St. to Gojo-dori St. in summer (from May 1 to September 30). 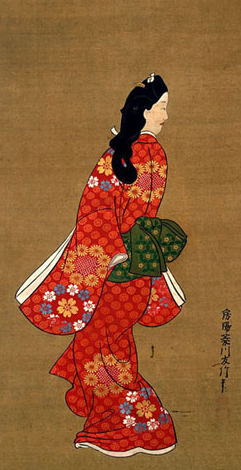 The custom goes back to the Edo period (1603-1867). 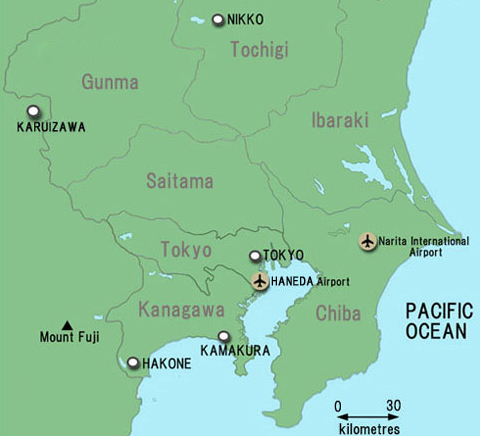 “Kawadoko” are similar platforms along the Kifune area and Takao area, and this Kawadoko has a relatively short history compared with “Noryo-yuka”. 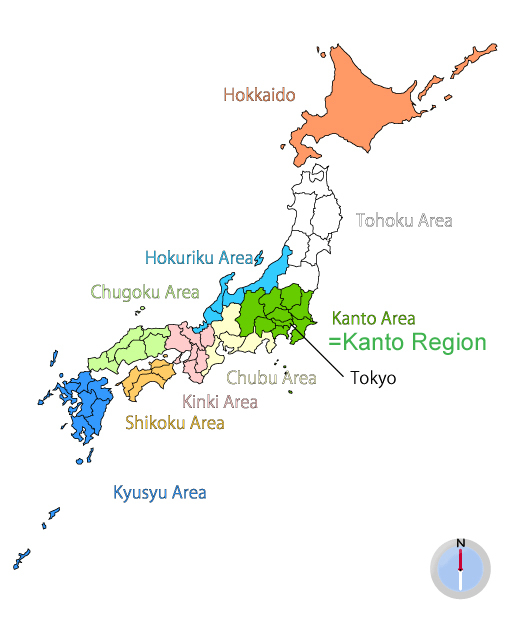 Formerly, Most of the restaurants in Kyoto specialized in the country dishes. However, recently, they have diversified and internationalized; Chinese, Thai and Korean cooking. 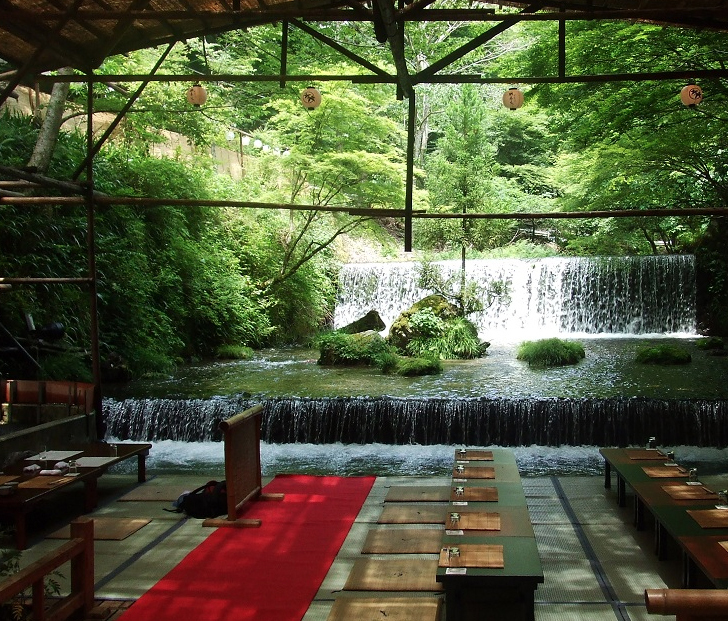 Now, a lot of first-class restaurants are open, and there are restaurants that we can enter in light-heartedly, too. 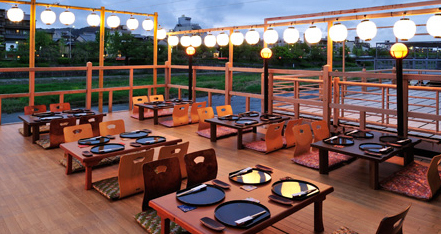 Incidentally, please take notice Noryo Yuka not open in the daytime except May and September. 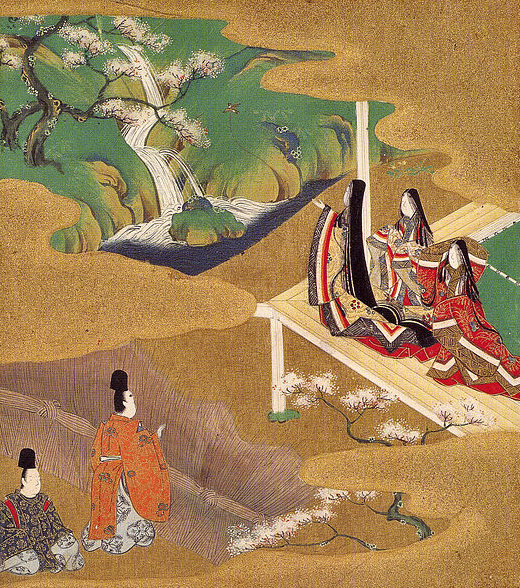 The riverside of the Kamo River had been an entertainment area for people of Kyoto since Nanboku-cho period (1336-1392). 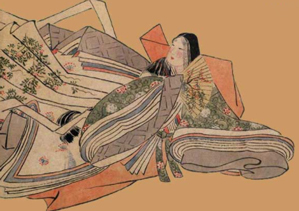 Enjoying the cool breezes of the evening flourished, especially in summer, and many performances were held in the riverbed of the Kamo River where the folding benches called “Shogi” were set up from Sanjo-dori St. to Matsubara-dori St. 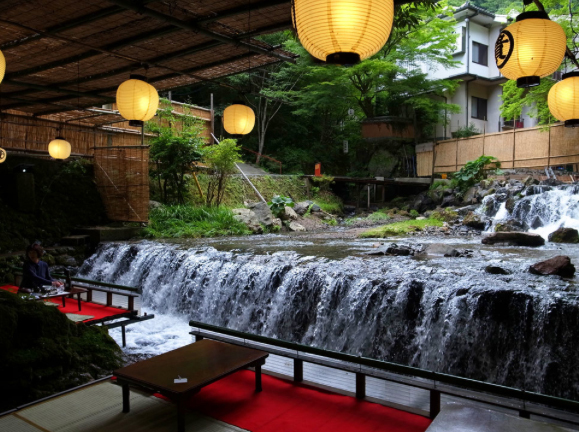 In the 27th year of Meiji period (1894), the wooden terraces, which some east riverside restaurants had owned, were pulled down due to completing the works of a canal. 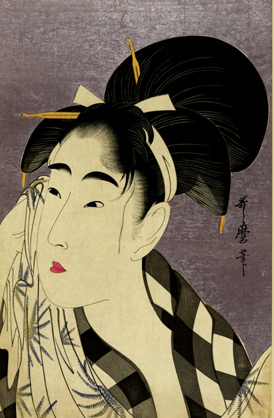 And Noryo-Yuka was quite abolished for some time due to opening a municipal streetcar because the Sijo-ohashi Bridge was rebuilt across the Kamo River in the last Meiji period. 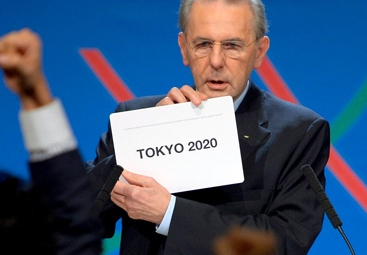 The summer Olympics will return to Tokyo after a wait of 56 years. 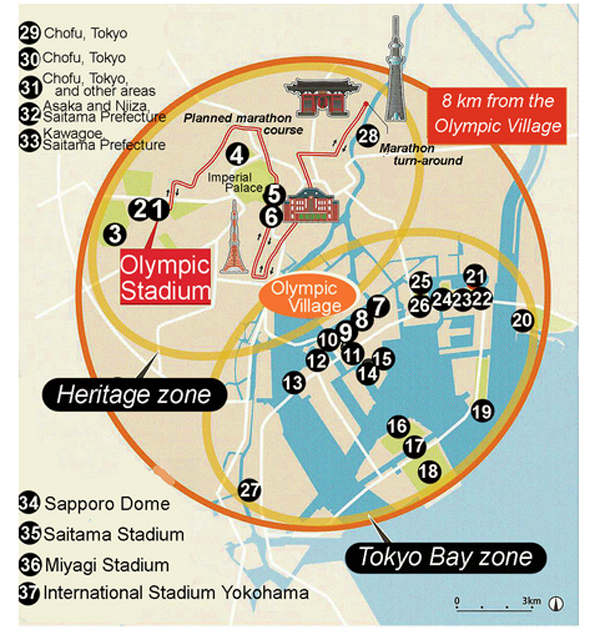 Here is a venue guide offered by a japanese newspaper for the 2020 Tokyo Olympics based on plans submitted by the Tokyo 2020 Bid Committee. 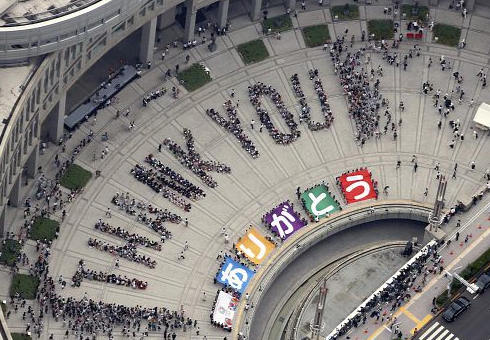 “Thank you” in both English and Japanese is spelled out by a crowd gathered in front of Tokyo City Hall on Sep. 8th. 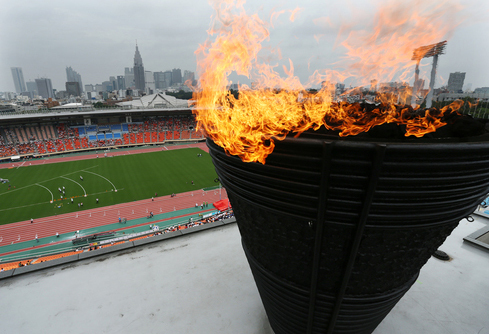 An Olympic flame burns at the National Stadium in Shinjuku Ward, Tokyo. 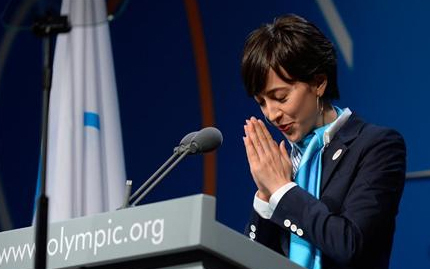 The stadium was the main venue for the 1964 Summer Olympics, and the flame was lit again to celebrate the selection of the capital as the site for the 2020 Games. The stadium will also be used for the 2020 Games after a major renovation. 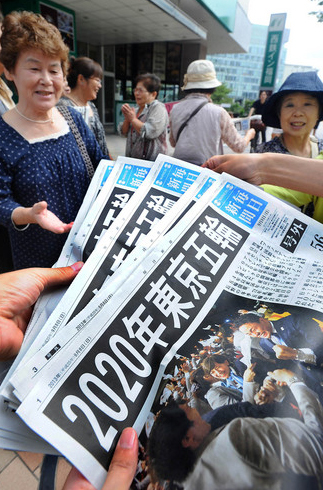 Pedestrians receive copies of the newspaper’s extra on Tokyo’s successful bid to host the 2020 Summer Olympics in Chuo Ward, Fukuoka, on Sept. 8th.